It's been a year and change since we last chatted about Mefi's Own (tm) cstross's Laundry series, and there's a new one, so, let's hit it. I'm a little bummed that we got Mhari POV for almost the whole thing, and only a couple of throw-away lines about the status of Bob and Mo after the rather world-changing climax to the last book. I'd also complain that the A-plot was almost entirely unsuccessful, in that the Black Chamber's master still seems to be in charge in the US, except Mhari clues us in that the A-plot mission was probably secondary to her other task. A couple of long-term characters got offed (or nearly so, or soon to, as it were), but that's fairly typical for the series at this point. I'm not sure how I feel about the elf-on-the-spectrum bit. On the one hand, inclusive characters, yay! On the other hand, it felt kinda stunty, since we've already seen Cassie's interior monologue in a similar assimilating-an-alien-human-personality situation, and made me moderately uncomfortable in terms of reading another instance of "white male author writes minority viewpoint." I'm also a white dude, so I'd be curious to hear how it worked, or didn't, for others. I have it but am currently embroiled in another book. Soon, though, soon. I enjoyed this. I particularly enjoyed the details about Concorde - I hadn't realized how much more capable it was at supersonic flight than military jets. Reading on the Kindle with the ability to select some words and instantly preview them on Wikipedia proved extremely useful. Speaking of Concordes, the way CStross keeps bringing up 304 and its unspeakable payload makes me think there is some serious Chekov's Gun stuff going here. The White Elephants have been a plot point in at least one other book now, and I can't imagine all that setup going nowhere in a Laundry novel. I'll admit I guffawed when I realized they were setting up for a Fulton pickup. I actually didn't twig to the flying-superhero-instead-of-balloon bit until it was happening, though. I think it's fair to say I have an exceptionally large vocabulary — CStross's is the only fiction I read that uses multiple unfamiliar words per book (not counting nonce vocabulary). I like learning new words. Yeah, I was a bit uncomfortable with the “elf-on-the-spectrum,” if only because she had so many things going on in her fairly small stage time that it felt — tokeny? On th other hand, Stross has a history (and not a bad one) of presenting diverse characters and letting them be themselves as the plot rolls along. I also agree with the book feeling like it was mostly laying pipe for the series, but it was fun and atmospheric, with some good set pieces — the fight in the restaurant, the radio station sub-story, and the stuff with the Mouthpiece. I also enjoy the normalcy of the new government, the way people shrug and get on with their lives as they slip literally toward the Abyss. It’s trenchant any (usually) understated commentary. 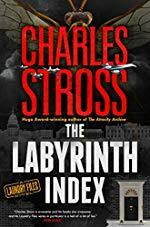 I wonder if the events of the last two books have been Stross’s way of trying to find a more malign political situation than the one we found in 2016. It’s hard too be more malevolent than the world we currently inhabit. I wonder if the events of the last two books have been Stross’s way of trying to find a more malign political situation than the one we found in 2016. The point at which the published version of The Delirium Brief departs from the pre-Brexit draft is the moment when Bob is arrested—and, subsequently, the entire agency is shut down and goes on the run, with Continuity Operations in effect. None of that featured in the first draft (nor the tank-v-Mercedes chase on Salisbury Plain). It gave the post-Brexit draft a degree of tension and jeopardy that the earlier draft lacked, and a lot of added foreboding and darkness: the re-appearance of The Mandate, the rehabilitation of Iris Carpenter, and the ghastly hospitality suite at Nether Stowe House all emerged fluidly from the new sense of impending catastrophe. I enjoyed being in Mhari's head, instead of Bob's, for a while- as cstross puts it in the same post, "Bob in particular has "leveled up" so far that he's quite hard to use as a sympathetic viewpoint character in a work of fiction"